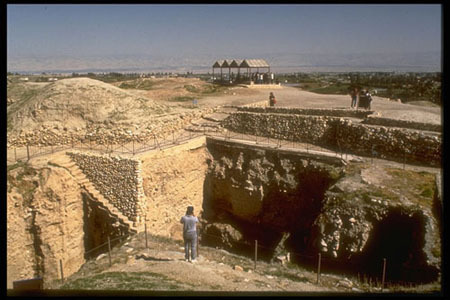 Now the city of Jericho was tightly shut up because of the Israelites. No one went out and no one came in. When Joshua had spoken to the people, the seven priests carrying the seven trumpets before the LORD went forward, blowing their trumpets, and the ark of the LORD’s covenant followed them. The armed guard marched ahead of the priests who blew the trumpets, and the rear guard followed the ark. All this time the trumpets were sounding. But Joshua had commanded the people, “Do not give a war cry, do not raise your voices, do not say a word until the day I tell you to shout. Then shout!” So Joshua had the ark of the LORD carried around the city, circling it once. Then the people returned to camp and spent the night there. Joshua got up early the next morning and the priests took up the ark of the LORD. The seven priests carrying the seven trumpets went forward, marching before the ark of the LORD and blowing the trumpets. The armed men went ahead of them and the rear guard followed the ark of the LORD, while the trumpets kept sounding. So on the second day they marched around the city once and returned to the camp. They did this for six days. When the trumpets sounded, the people shouted, and at the sound of the trumpet, when the people gave a loud shout, the wall collapsed; so every man charged straight in, and they took the city. They devoted the city to the LORD and destroyed with the sword every living thing in it — men and women, young and old, cattle, sheep and donkeys. . . . Then they burned the whole city and everything in it, but they put the silver and gold and the articles of bronze and iron into the treasury of the LORD’s house. What aspects of this story are most memorable? Most surprising? Most unbelievable? What does this story reveal about God, and us? This has to be one of my all time favorite stories from the Old Testament! I always imagine how the people of Jericho must have laughed and scoffed at Joshua and the Israelites. I’m sure to them, the Israelites looked foolish, and to be painfully honest, I think had I been one of those Israelites I may have felt a bit foolish too. 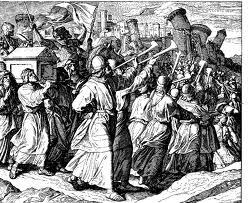 I may have even questioned God and His methods…..I admire the Israelites and their obedience, their persistance and their willingness to wait on God (by not shouting until they were told to). I think this story clearly reminds us that God’s ways are not our ways. That He has a plan and is always in control. That at times we may have to step out of our comfort zones to worship Him and obey Him…even if others scoff and ridicule us. That we must be persistant and consistent and finally that we must be patient and wait on Him. I agree. How do we yield to God’s vision of how we are to act? Easy to ask. Hard to do. So if I was a citizen of Jerico, even if I did fear the Israelite God and wanted to flee I was stuck. I can imagine feeling hopeless, being afraid for my children and knowing that time was running out. There were no fence sitters in this story – you were ‘in’ the city of Jerico OR you were ‘out’ marching with Joshua. There must have been some innocent victims in this village and I feel sorry for them. In Sunday’s Scripture, I’ve decided to drop the last few verses. They are very troubling. It opens up whole new issues, which I would rather not address this week. So, God performs miracles in mysterious ways. We must learn patience and obedience from this lesson. However, the problem I have is part of the ten commandments states ” Thou shall not murder”. To me this is what was performed to the people of Jericho. Does this mean that murder is justified if ordered by God? As a believer, I would have to say that NO one in Jericho was worth saving. This could have been the beginning of the death penalty for harsh people. Interesting.